It's a fact well known that coffee addicts will not entertain anything you have to say to them before they've have their morning caffeine fix, no matter how important the issue at hand is. Coffee is one of the most popular caffeinated drinks around the globe. The delicious brew now has many avatars with people experimenting with flavours and tastes more than ever before. From ghee coffee to raw egg coffee, and even mushroom and broccoli coffee, your favourite morning drink has been put through a whole lot of innovation, albeit with some cringe-worthy and even downright disastrous results. Then there's that wildly popular golden latte or turmeric latte - coffee brewed with the incredibly healthy haldi or turmeric powder. But turmeric isn't the only spice that you can add to your cup of coffee. Coffee snobs may turn their noses up at the mention of any of these fusion or flavoured coffees, but some of them may be worth a try, not just for the unique flavours but also a delightful health kick. You might be surprised to know that ginger coffee is quite popular among coffee drinkers around the world. 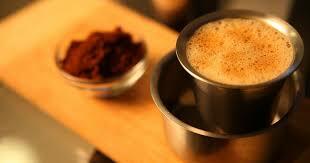 Ginger spiced instant coffee powder is available in the market. But if you roast and grind your beans at home, then you can simply mix your freshly ground coffee with a few slices of fresh ginger or add some ginger powder to it, before brewing to get a delicious spiced brew. There are many ways of making orange spiced coffee. You may add orange liqueur in your iced brew, if you're in the mood for some 'weekending'. Alternatively, you can add orange zest along with your ground coffee beans in the filter of your electric coffee maker to get the orange spiced coffee. Add some cinnamon and brown sugar to the brewed coffee and voila! If you like your brew cold, then toss in some ice and top the drink with some whipped cream. Cardamom, or elaichi, is a spice that any batch of masala chai is incomplete without. But did you know that it can even be added to coffee? The green spice with tiny black pods can be brewed with coffee for an aromatic brew that is sure to relax you. Cardamom also has anti-inflammatory properties and hence, makes for a great addition to your mandatory cup of coffee. Chicory, also known as kasni in Hindi, is a pretty flowering plant has roots that are roasted and brewed with coffee to get a delicious brew that is described as earthy and nutty in taste. Chicory root has been known to aid digestive health, regulate blood sugar and even fight inflammation in the body. Although chicory root is brewed alone to get a coffee-like drink, you may even add this to your actual coffee to reap its benefits.